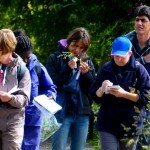 eXtreme botany heads North to Malham Tarn Field Studies Centre with Dr M and University of Reading Plant Diversity MSc students, this is #2 of Dr M’s MalHam Diary. 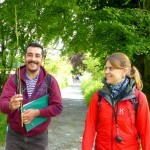 Day 2 Sunday: In which Dr M, Guest Tutor Hermione and students (and especially the Sedge Queen!) have a good Cyperaceous day! The day was largely spent in, on and around the board walk in the exceptionally floriferous and botanically wondrous Tarn Fen! 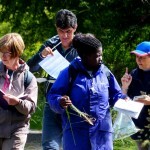 The walk in along Pepper Pot Lane allowed opportunities for consolidating knowledge on common species on the way. 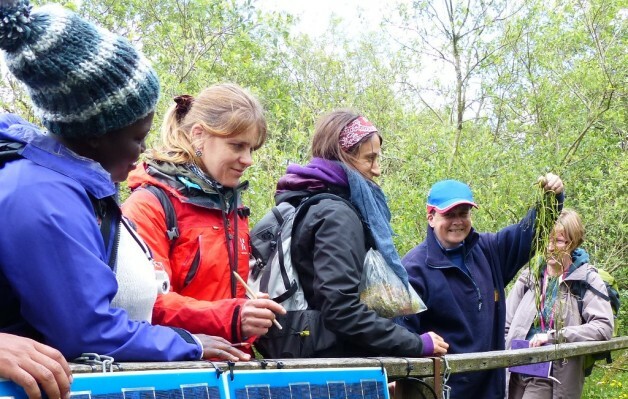 Once on the board walk, DrM’s students’ first activity was working on a 4m x 4m quadrat with Guest Tutor Hermione while Dr M collected Cyperaceae for the evening activity! Working hard and well as a group, students noted the woody species, monocots, dicots in turn and then ferns and collecting bryophytes for later ID. 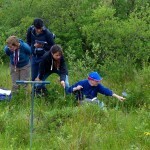 The students’ first quadrat was in fen vegetation rich in monocot and dicot herbs. 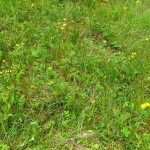 The main grass species was Molinia caerulea (Purple Moor-grass) with the smaller sedges Carex panicea (Carnation Sedge), Carex nigra (Common Sedge), Carex echinata (Star Sedge) and Carex pulicaris (Flea Sedge) and some larger sedges Carex rostrata (Bottle Sedge) andconspicuous tussocks of Carex appropinquata (Fibrous Tussock-sedge) and the rush Juncus conglomeratus (Compact Rush). Dicot herbs in colourful profusion included Succisa pratensis, Filipendula ulmaria, Valeriana dioica, Caltha palustris and Silene flos-cuculi (Ragged-Robin)together with the northern species Crepis paludosa and Trollius europaeus. Anemone nemorosa (Wood Anemone) was a surprise to some more used to seeing it in woodland but it is a frequent associate of the species-rich fen vegetation in this area. 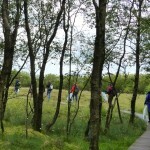 The vegetation at MalHam changes dramatically over a matter of just a few meters. From the group traversed the board-walk and, with a topographical rise of just one meter or so, set up our second quadrat in species-poor acid mire, with Ericaceous shrubs Calluna vulgaris (Heather), Erica tetralix (Cross-leaved Heath) and Vaccinium myrtillus (Bilberry) together with Cyperaceae such as Eriophorum vaginatum (Hare’s-tail Cottongrass) and calcifugous grasses Molinia caerulea (Purple Moor-grass) and Deschampsia flexuosa (Wavy Hair-grass) a very few dicot herbs such as Potentilla erecta (Tormentil). Finally there were conspicuous bryophyte species mainly Sphagnum species including Sphagnum papillosum and Sphagnum capillifolium. Continuing the walk on the raised bog we located the locality if the National rarity Carex flava (Large Yellow-sedge) over which we marvelled and then Count Ligule was pursuaded (and assisted by the Cyperaceae Queen) to collect an aquatic plant from the lag stream for Guest Tutor Hermione to ID later. 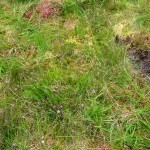 The walk continued through Salix woodland and out again onto acid mire where the essential reverential bow accompanied by much “ooing” and “aahing” was made to the insectivorous Drosera rotundifolia (Round-leaved Sundew) nestling in a bed of Sphagnum species. After dinner, Dr M unveiled his Cyperaceous evening classroom extravaganza for the delight and delectation of the student captive audience, there really was nowhere to hide! First up, the once in a lifetime never to be repeated opportunity to practice checking sedges for epistomous leaves, i.e. leaves with stomata on the upper surface rather than on the lower surface as more usual. 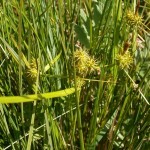 This useful character was tested using the veg key on several species with epistomous leaves: Carex rostrata (Bottle Sedge), Carex nigra (Common Sedge) (the atypical tall form which gous in the birch woodland) and Carex canescens (White Sedge). Dr M also insisted students practiced keying out these sedges with the Book of Stace to get that all important advanced keying practice on flowering and fruiting material. The example here was Carex lasiocarpa (Slender Sedge), collected by Dr M from the fen vegetation earlier. The Sedge Queen was a very happy person today as she and her fellow students found no fewer than nine species of sedge and, have no doubt, there will be more tomorrow! Dr M says: (And the Sedge Queen would agree) how can one not retire to bed Cyperaceously satisfied after such a fine day?! I did my O Level geography field trip at Malham; many, many years ago!